A guinea pig run is the perfect way to let your pets exercise outdoors without running the risk of them escaping, getting lost, or eating your flowers. It is essentially a large cage which you place on the grass to give them plenty of space to explore, but whilst being enclosed in a safe area. Guinea pig runs are generally made from a large, lightweight wooden frame, with wire mesh filling the gaps between the struts. Because of this simple construction, they are very light, and also provide your pets with lots of fresh air and sunlight. Many runs have a built in living area at one end, which allows your cavies to shelter from the sun or rain, or just get some rest after all their running around. Wooden guinea pig runs provide plenty of space to exercise. 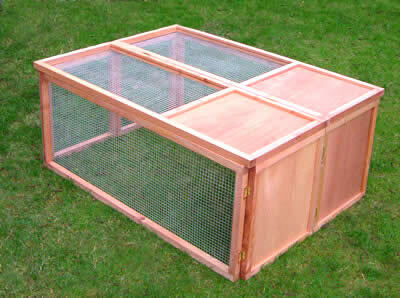 You can also buy runs which are made from galvanised metal, similar to the bars of a normal cage. These provide exactly the same features as a wooden run, and can even be slightly lighter. Also, while wooden runs tend to just be square, metal runs come in a few different shapes, such as those with circular walls. This makes no practical diffence, so you should buy whichever you prefer and suits your pigs' needs best. Manufacturers will often provide their runs in flat-pack form for ease of transporting. This does mean that you will need to assemble it when you get it home, but this is very straightforward, and all of the necessary tools, fasteners, and instructions will be included in the box. When buying a run, make sure it has a hinged door on the top, for quick and easy access to your guinea pigs. Most runs have these as standard, but some of the cheaper ones don't, and it can be a real challenge trying to lift your run up and grab one pig without the others escaping! Bear in mind that your pigs could potentially climb out through this door, and predators could use it to get in. To protect against these dangers, make sure the door can be secured with a clip or catch. 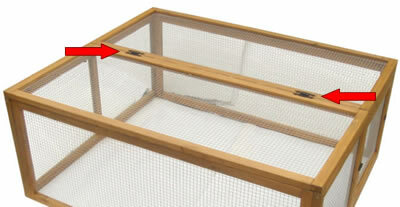 The hinges (labelled) allow the top of this run to be opened, providing easy access without risk of your pets escaping. A typical guinea pig run is in the region of 1.2 metres (4ft) along each side, and 30 cm (1 ft) in height, but as with cages, the bigger the better. The more space you give your pigs, the more exercise and adventure they can get, and the more they will enjoy their run time. Pay particular attention to the height of the run - guinea pigs like to jump up and down (an activity called 'popcorning'), and they will need space above their heads to do this. Guinea pig runs provide multiple benefits to your pets. First and foremost, they get plenty of exercise, which will keep them fit and healthy, and help them burn off any excess fat. A slimmer, fitter guinea pig is better equipped to fight off illnesses, and is also noticeably more active and lively, making it more enjoyable to own. Secondly, guinea pigs have an adventurous side, and love to explore their surroundings. A large run will allow them to do this, and you can even give them a selection of toys and obstacles to make things even more interesting. Finally, you will find that your pets love to chew on grass while they are in their run. This aids digestion and helps to keep their gut healthy. You should always place your guinea pigs' run on a soft surface, as their delicate feet can be easily damaged on hard or rough ground. During the summer months, place the run on your garden's lawn to provide cushioning for your animals' feet, and something for them to chew on. Be sure to put the run on even ground, or you may find that there are gaps under the bottom of the frame which are big enough for your cavies to escape. 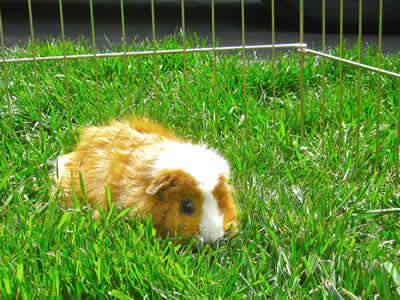 When the weather allows, put yours cavies' run outside on grass. This gives them a soft surface and something tasty to chew on. Image by Nick Busse. If possible, you want to place the run out of direct sunlight. However, due to its sheer size, it can be difficult to find a shady patch large enough. Try to get at least part of the run in shadows, so that your pigs have a place to shelter if they get too hot. They can also hide in the run's built-in shelter if it has one. From time to time, you should move your pigs' run to a different location. This will give them some fresh grass to chew on and help stop your lawn getting a bald patch! In the winter, the ground outside is too cold for your guinea pigs to walk on, and the poor weather and cold wind makes conditions unsuitable for outside exploration. However, you can still use your run inside if you have a large enough room. Again, you should put the run on a soft surface - carpet is ideal, or you can cover a hard floor with towels and sheets to make it suitable to use. Using a guinea pig run really couldn't be simpler - just set it up, pop your pets in, and let them roam free. It can be tempting to put them in and then leave them alone, but you should really supervise them at all times. This will allow you to react quickly if one tries to escape, and it will also help to keep any predators away. You should never leave your guinea pigs in their run overnight - they will be scared, susceptible to the weather, and prone to attack by predators such as badgers and foxes. You should never put your guinea pigs in their run with other animals, such as rabbits. There is a danger that they may attack each other, or of a larger animal accidentally injuring a small one. 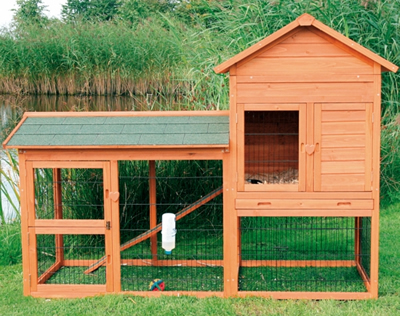 As well as dedicated runs, there are a number of products for sale on the market which combine a hutch and run to provide an all-in-one housing solution. These generally come in two types. The first type consists of a hutch with a run underneath it. The idea behind these is that they provide both areas without taking up any extra floor space. Unfortunately in most cases, neither area is big enough to properly serve its purpose, so ideally these should be avoided in favour of two separate, properly designed units. If you decide to buy a combined hutch and run, make sure that both areas are large enough. The second type has a full-sized hutch and a full-sized run attached side by side. These can be ok in the summer months, provided each is big enough to fulfil its role. However, in the winter you will need to detatch the run and seal up the adjoining hole to prevent your pets getting cold or wet. Additionally, a run is not very secure, and can provide an easy way for predators to break in and attack your animals. Because of their simple construction, anyone with some basic know-how and equipment can design and build their own guinea pig run. You can buy or create your own plans, which should consist of a simple wooden frame with supporting struts, which is covered in wire mesh. With just a few hours work you can build a run to your exact requirements, making it a very cheap and effective alternative to buying one. A guinea pig run provides a convenient, effective way to exercise your pets and allow them to enjoy some fresh air. It should be considered an essential item, second only to a good-sized cage. By providing your pets with a large exercise area, you will help to keep them active, healthy, and contented.